Executing on a content marketing strategy is a lot of work, but when you combine the efforts of a well-managed team, the results can be downright magical. The challenge, of course, is co-ordination - each contributor has conflicting priorities, and their own, unique style. To keep everyone on the same page you need an editorial calendar. 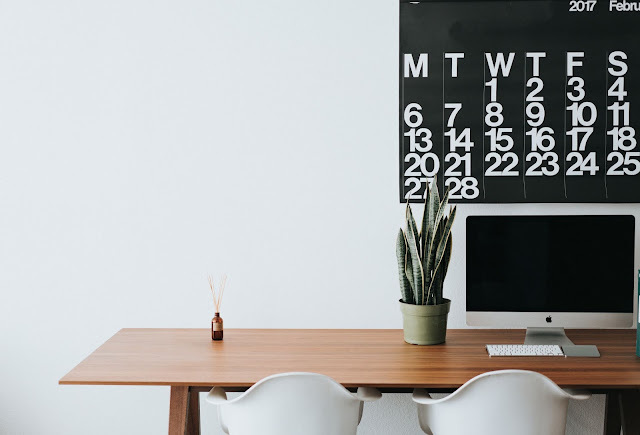 In its simplest form, an editorial calendar is a document that communicates what you plan to publish, when you'll publish it, and who'll handle each component. 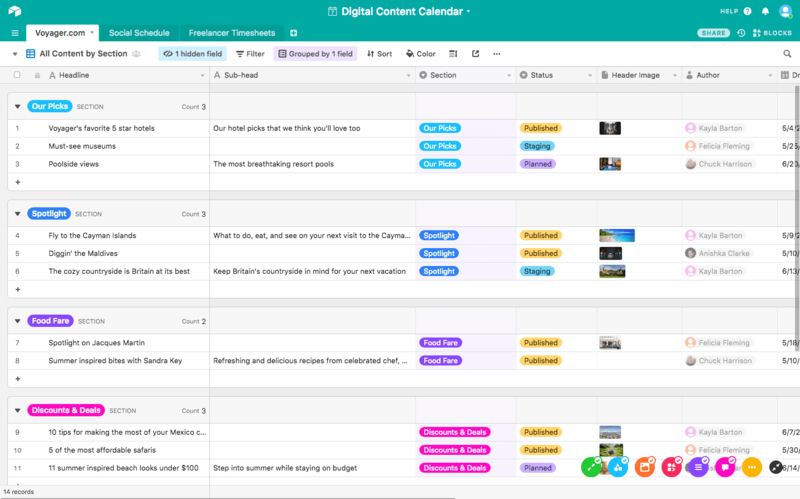 But if you choose the right tool it could do so much more - an editorial calendar can also help you clarify the purpose of each piece of content and improve collaboration within your team/s. But there isn’t one solution that’s ideal for everyone - the trick is to identify a tool that suits the complexity and frequency of your publishing schedule, and that your team will actually use. Here are five ways to build an editorial calendar, and the pros and cons of each approach. Spreadsheets are great for many organizational tasks, and that includes editorial calendars. Anyone with a computer can access some form of a spreadsheet, and as long as you keep it simple, most people are reasonably comfortable using one. 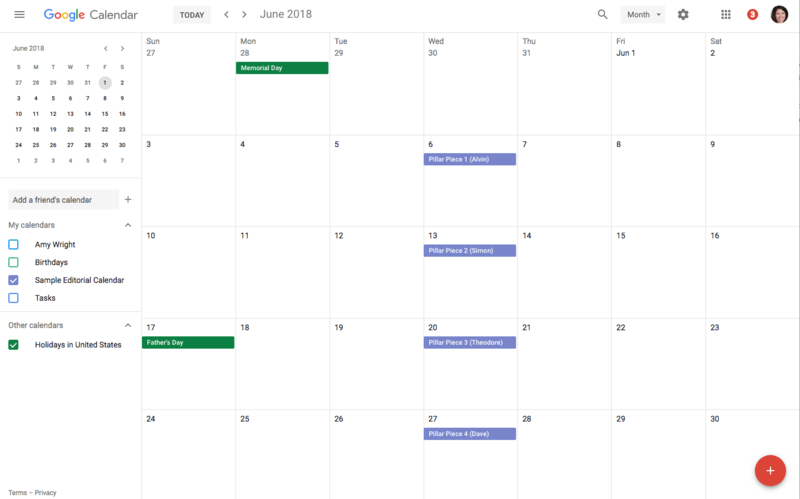 Spreadsheet style editorial calendars are best for content teams which publish once or twice per week (or less), and it’s useful to set them up in a common environment (like Google Docs or OneDrive) so you can share them with your team members and collaborate on changes. I sometimes see editorial spreadsheets that have been set up to look like an actual calendar - personally, I find that this limits the tool’s utility. Instead, I prefer to use the traditional row and column layout, so I can manipulate and sort the data when I need a different view. In addition to the columns shown here, it's often helpful to include other information. For example, I like to add the search volume for my target keywords and links to relevant research. Low barrier to entry. Most people have access to and feel comfortable using a simple spreadsheet. Limited adoption challenges. Team members can incorporate this tool into their existing file structure and workflow. Some collaboration capabilities (if the spreadsheet lives on a shared drive). Few limitations. You can use a spreadsheet to do almost anything. Spreadsheets require manual maintenance. If your entire team doesn’t commit to using this tool it will become dated. Limited scalability. Spreadsheets are great for small teams who publish once or twice a week, but they can become unwieldy if your publication frequency increases. Permissions must be carefully managed to avoid unwanted changes to this critical document. If your team uses Google Calendar, setting up a separate editorial calendar in that same environment is another viable option. Then select your new calendar and click on the three vertical dots to the right of the name to edit the settings and share the calendar with your team. 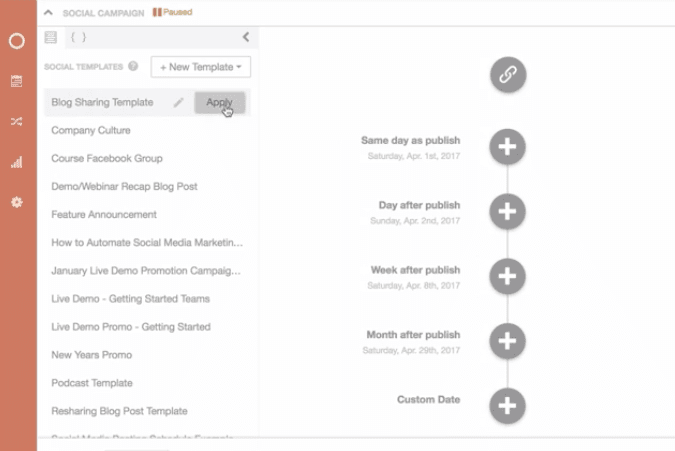 Now you can populate the calendar with your content plan and keep everyone informed of the publication schedule. Add alerts, files and links to each entry, so that your authors will have access to everything they need to complete each piece. Like spreadsheets, using a Google Calendar to manage your content production schedule is best when your publishing frequency is light - although the tool is familiar and there are some collaboration capabilities, it can become frustrating to those who publish a lot of content. Low barrier to entry. 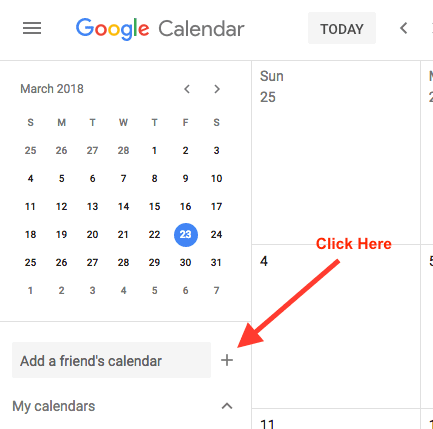 Google Calendar is free, familiar and easy to use. Limited adoption challenges. Those who already use Google’s suite of tools will find it quite natural to integrate this option into their workflow. If your team doesn’t use Google Calendar they may not be willing to start now. Limited scalability. This is a very simple solution. Using Google Calendar to manage your editorial process can become cumbersome if your publishing frequency increases. Limited collaboration capabilities. Complex editorial workflows would benefit from a more robust tool. If your team already uses a productivity solution, you might be able to build an editorial calendar right into your existing tool. 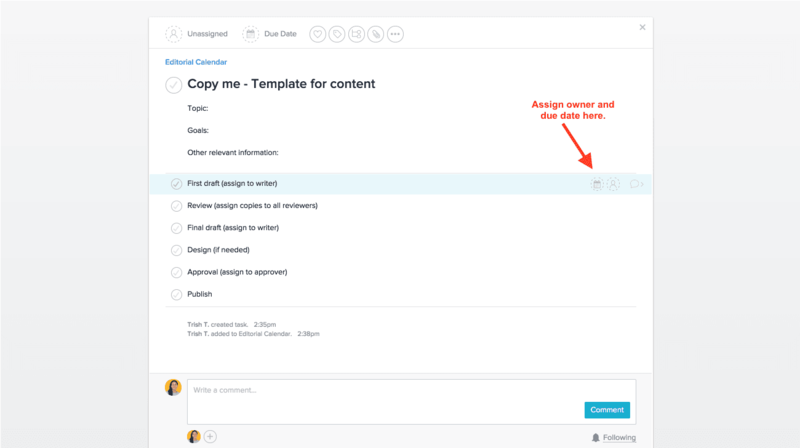 This is a terrific option when several team members work on each piece of content - the right solution can help you manage that workflow and keep everyone informed. There are many such tools, but I prefer Asana and will use it to illustrate this point. Asana organizes work into “projects” and the individual “tasks” related each project. You can then view those tasks as a list or on a “Kanban” board - here's an example of an editorial calendar project in Asana that has been set up using the Kanban method. In this example, a card represents each piece of content (or task) you intend to create. As work is completed, you move the cards from left to right to visually track your progress. But the real magic happens inside each individual card. Within each card, you can break down tasks into subtasks, and assign them to individual contributors. For example, if you need a graphic for your next blog post, you can assign that subtask to your graphic designer, and that person will then get an alert (with the requested due date). They can then either accept the assignment or request a change. You can also attach files and communicate with your team right within the tool - this means you'll have everything related to each piece of content in one place. 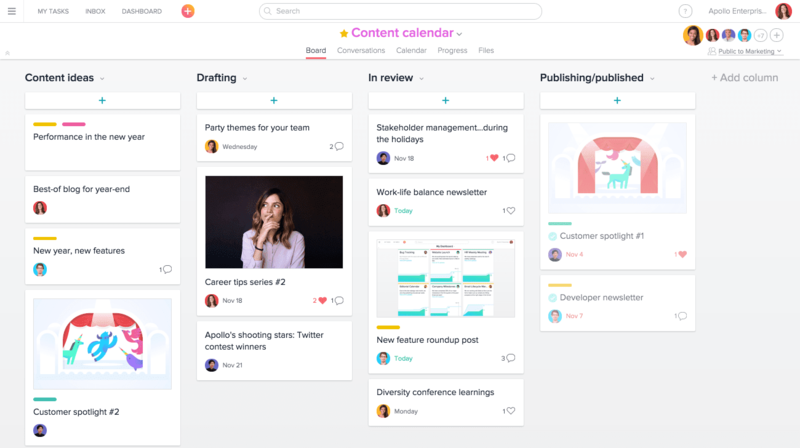 This is just one example of how you might use a productivity tool to create an editorial calendar and workflow - the list of pros and cons will vary based on the tool you choose and how you use it, but here are the pros and cons of using Asana. If you already use the solution you can build your editorial calendar right into your existing task management workflow. This negates the need to juggle documents or manage a complicated solution adoption process. Collaboration features make it easy to communicate the status of individual pieces of content and their associated tasks. This will help you avoid bottlenecks. Premium features add rich project management functionality that improves the tool’s utility. If your team doesn't use a common tool for collaborating on tasks, you'll need to agree on a solution and go through an adoption process. 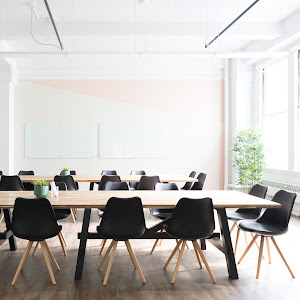 Most productivity tools were designed to manage a wide variety of projects and tasks, which means that they may lack features of particular interest to content managers. 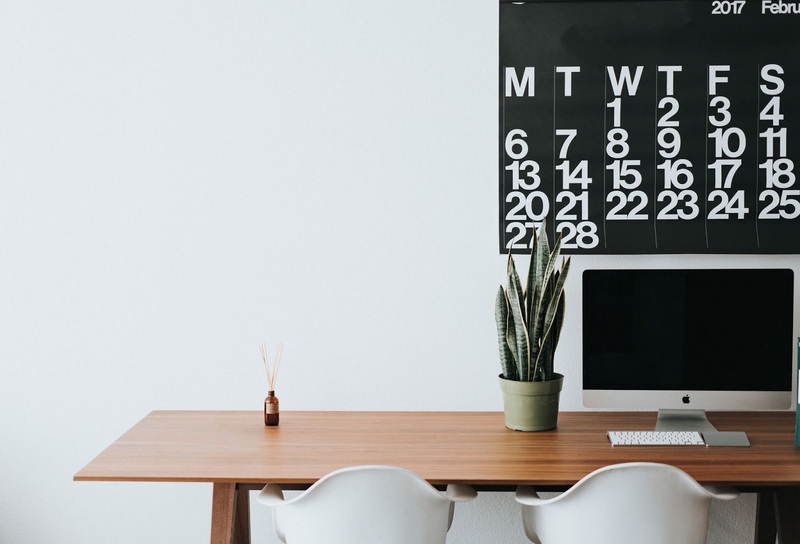 Building an editorial calendar into your productivity solution should work for a moderate production schedule but may challenge your ability to scale. If you like this concept (especially the Kanban method), but don’t think Asana is right for you, Trello and Monday are good alternatives. Spreadsheets and collaborative to-do lists are perfectly fine for managing the content needs of a small team, but you may find that you need a more robust editorial calendar solution as your program matures. Airtable is a good option for people who like using spreadsheets but need something more. Airtable is a cloud-based application which offers the deep functionality and relational aspects of a database in a visually appealing spreadsheet format. The tool enables you to collaborate with team members, attach files and segment data - a basic version is available for free, while feature-rich upgrades are $20 per user, per month. This tool is useful for managing a rigorous editorial schedule. There is a learning curve, but Airtable provides use case templates to get you started. Here's a screenshot of their digital content calendar template. I choose this template because it shows how Airtable can work for a large, prolific team. They also provide simple templates for smaller scale projects, such as the management of the editorial calendar for a blog. Superior collaboration capabilities when compared to spreadsheets. Provides robust relational database functionality, combined with easy ways to view and sort the data. This flexibility satisfies spreadsheet fans while also accommodating visual types with calendar, Kanban and gallery views of the same data. Offers integrations with many popular applications. This makes it easier to build the solution into your workflow. Significant learning curve, particularly for those who are not familiar with databases. Airtable isn’t mainstream yet, which means you’re adding a new tool to the mix and may encounter resistance. Spreadsheet power users may expect certain functionality that isn’t yet available. This will require patience. The solution is becoming quite popular and is adding new capabilities all the time. Like a spreadsheet, manual updates are necessary to keep the tool effective. This solution wasn’t designed specifically for marketers. Marketing-centric features are present but aren't necessarily a top priority. CoSchedule is a content planning and execution tool designed for marketers. 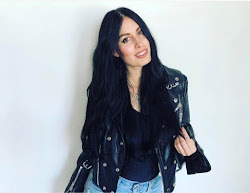 You can use it to build an editorial calendar for all your content and campaigns, while you can also use it to collaborate with contributors and schedule social media posts, all in one place. 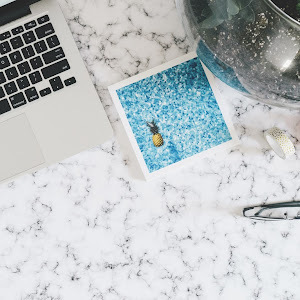 The company offers a wide range of pricing options - basic capabilities for bloggers start at $40 per month. The most advanced level of functionality (for enterprises) is $1,200 per month. Planned content is presented on a calendar, which can show everything or a filtered view. You can manage each piece of content using a customizable, collaborative workflow, so that you always know where things stand. 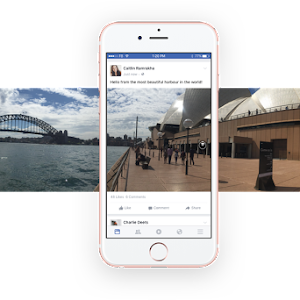 You can also set up a social sharing plan for each piece of content and use it to populate a built-in social media scheduling tool. Useful for managing all types of content – blogs, resources, social media content, graphics, white papers, etc. Handles the entire content production process – from ideation to publication to social promotion. Doubles as a scheduling tool for social media posts. 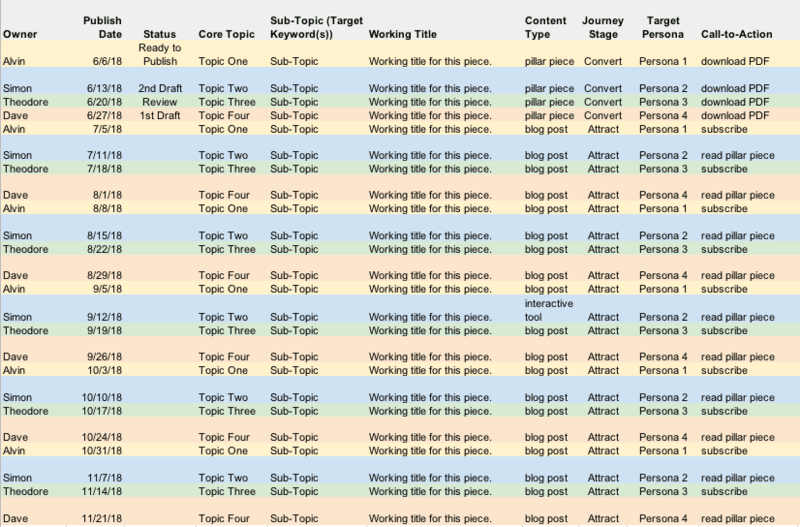 You can set up the entire social sharing plan for each piece of content as part of your content creation workflow. Yet another tool to adopt and integrate into your workflow. It’s great if all you work on is content, but it doesn’t accommodate the need to manage other types of tasks (the company recently implemented an integration with Zapier, which may make this issue easier to work through). 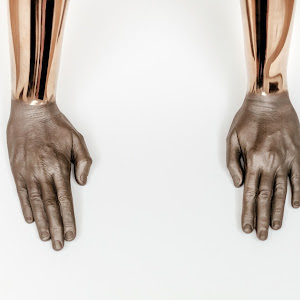 Analytics data is limited to the impact of social posts. The calendar format is the only option for viewing your plan - you can't convert it to list form. Calendar data resides in the tool. You can't extract it for further analysis. For example, if you want to conduct a content audit, you'll need to build an inventory of your content separately. The system you select for documenting and collaborating on your editorial calendar will have a big impact on your efficiency. Defining your requirements, and exploring the solutions above, is a good place to start if you’re working with a small or medium-sized team. There are other options that may be more suitable to your situation, but we'll save that discussion for another day.